Frequent breakouts of Pimples are referred to as Acne. Infected blackheads and whiteheads usually lead to the formation of Pimples. Contrary to the popular belief, Pimples are not caused due to dirt, sweat, or consumption of oily foods, chocolates, etc. Though, the popular conception that Pimples should not be squeezed holds true. The act of picking or squeezing Pimples is discouraged as it may lead to further inflammation and scarring. Although many over the counter medicines and creams are often suggested to cure Pimples, still people are more attracted towards the natural cures in the form of natural home remedies for Pimples because they are safer and cheaper than the conventions methods of treatment. 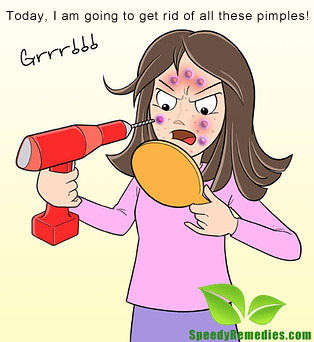 As already mentioned, overactive oil glands play an important role in causing Pimples. The oil glands tend to become overactive due to overstimulation caused by hormonal changes. The hormonal changes could be triggered by puberty. Hormonal changes caused by menstrual cycles also contribute in the development of Pimple in women. Though, the problem tends to subside once the hormones settle down. Hereditary factors may also be held responsible for causing Pimples and Acne in some cases. Medicines containing lithium, iodides, bromides, steroids etc have been associated with the worsening of Pimples. Repeatedly washing Pimple affected area may also aggravate the problem as skin tends to produce more oil in response to repeated washing and harsh scrubbing. Stress has also been associated, though indirectly, with frequent breakouts of Pimples. • Lemon juice can also be applied in combination with an equal amount of groundnut oil to prevent as well as cure this embarrassing problem. Similarly, lemon juice can also be added to sandalwood powder and the application of the resultant paste can help reduce Pimples to a great extent. A combination of lemon juice and cinnamon power is also beneficial in Pimple treatment. • Honey is also considered good for skin. Applying a mixture prepared from three tablespoons of honey and one teaspoon of cinnamon powder over night is another popular natural cure for this irritating problem. This natural remedy is sure to give encouraging results if religiously followed for at least two weeks. • Applying a mixture of coriander juice and some turmeric is an effective home remedy for Pimple treatment. Alternatively, if coriander juice is not available then mint juice can be used in its place. • Add two to three teaspoons of dried basil leaves to one cup water and boil the mixture for about 15-20 minutes. Cool the mixture and then apply it on the affected area. This therapeutic home remedy should be followed on a regular basis to get rid of Pimples naturally. • Take some roasted and powdered peels of pomegranate fruit. Next, add some lime juice to this powder to make a paste like mixture. Applying this mixture is one of the most valuable natural home remedies for Pimples. • Take some fenugreek leaves, crush them and add sufficient water, just enough to make a paste. Apply this paste on the face over night and wash it off with warm water in the morning as an effective natural remedy for natural Pimple removal. This remedy is particularly useful for individuals with dry skin. • Take some grinded nutmeg and add a little raw milk to it. Apply the mixture and leave it for about one or two hours. This natural home remedy is not only beneficial in curing Pimples but is useful in getting rid of their scars as well. • Applying a mixture prepared from fuller’s earth and some water or rose water is a tried and tested Pimple cure. Fuller’s earth helps absorb excess oil from the skin. Judicious mix of a variety of fresh fruits, vegetables, grains, seeds etc constitutes a healthy and balanced diet. A diet rich in vitamin A and zinc is highly recommended to deal with this problem. Moreover, consumption of wheatgrass juice helps in controlling Pimples effectively. Oils extracted from corns, sunflowers, and safflowers have been associated with therapeutic properties for curing as well as preventing Pimples. Plus, regular and adequate consumption of fruit juices and water is considered favorable for the skin. Though, fried and fatty foods do not cause Pimples by themselves, still they do not even help in the process of healing. Self control is the essence of any favorable treatment. Caffeinated and sugary products tend to produce toxins which are harmful for the overall health. Moreover, over consumption of junk food may prove to be unfavorable for the healing process. i wash my face with cetaphil daily facial cleanser in the morrning then at night i was with Oxy maximum face wash followed by clean&clear persa-gel 10 that i keep on my brakeouts over night when needed. but it doesnt seem to be clearing as much as i want.. any tips?? ill try lemon juice wl rosewater.thanks a lot. Please donâ€™t use garlic for pimples it will burn your face. I tried and it burnt my face. hi.first i have 3 pimples on my face then i use pendrem+ to reduce it.but now much pimples come.can i know how to treat it naturally?? Tnks alot, i tried it nd its work for me. hello i’m 25yrs old. I suffer with problem of pimples since 2ys before it was not there , please suggest me for proper remedies of pimple. My face has more marks of pimples.give me good solution for this problem.my confidence has gone down so please help…. i do have pimples for 7 years still i am suffering, in last 7 years i have consulted 3-4 times with doctor that treatment carried for 1month and i was rid off but now it is again i am taking homeopathic medicine. Stop using soap or any face-wash for the face. Instead use only besan (chickpea flour) to wash your face. In a month’s time, pimples would be cleared. It is cheap and the best home remedy. on my cheeks and my forehead.my pimples are in red colour.plssssssss give me best sujestion. u can use multani mitti with besan and haldi…it will cure…. hello,please i need help concerning my pimples because this thing was so stubborn and i’ve been treated it for almost two years now and when it goes,it will still comes again,please help me because this is too much. hi. i have pimples on my face then i use pendrem+ to reduce it.but now much pimples come.and much growth of face hair.. can i know how to treat it naturally?? i have acen my face,and also have a some black spots on arms.what should i prefer? yes,,,so efective applying fresh lemon or lime,that was way back long time during my young age, i did and finally successful indeed pimple well controled,no frustrated and more become self confidence…thats my experience never forget…. they are small balls covered with skin remove it and ea it u can also soak it in Littel water also.